I still remember the first time I had the taste of this special fish curry. It was when I had joined my husband in his Regiment in the Army. I had a warm welcome and the ladies in the Unit tried to make me feel at home. The senior officers and wives sent us lunch and dinner and mind you, that is something. That’s how I had my first Bengali Fish Curry aka Maccher Jhol. Hailing from the South, I wasn’t accustomed to the strong flavor of mustard and my husband had warned me before taking the first bite. Yes, it was different but I had loved it. It was new and my palette had welcomed the refreshingly variant taste. Just like Keralites, Bengalis are also extremely fond of fish. Okay. Excluding the vegetarians. Deny us our staple of fish for lunch, and face the wrath forever! Ever since that first jolt and bang of the Bong curry, I had been wanting to try cooking it. But I never got that perfect recipe or the courage to make. Until..
Maccher Jhol is a classic. 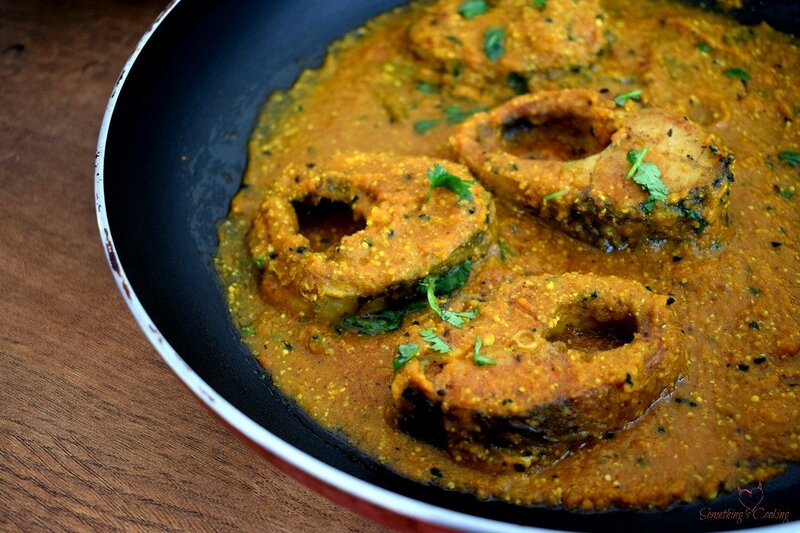 Maccher Jhol means Fish (macch) in curry/gravy (jhol). It has few ingredients and they play an important part. The strong flavor of mustard and the hotness of green chillies makes the dish terrific and different from other fish curries. You might find it spicy, but oh yeah, you can’t stop eating! 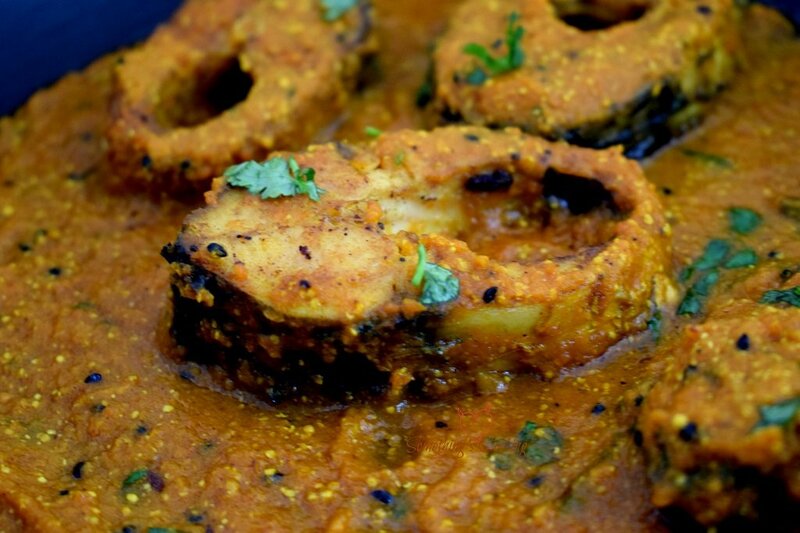 Use fishes like Rohu (a kind of fresh water carp), Sea Bass or Tilapia for preparing this dish. While cooking with mustard oil, the oil is heated to a smoking point and then cooled down, before using it. This is because mustard oil contains erucic acid which gives a strong pungent smell. Heating to smoking point reduces the pungency. 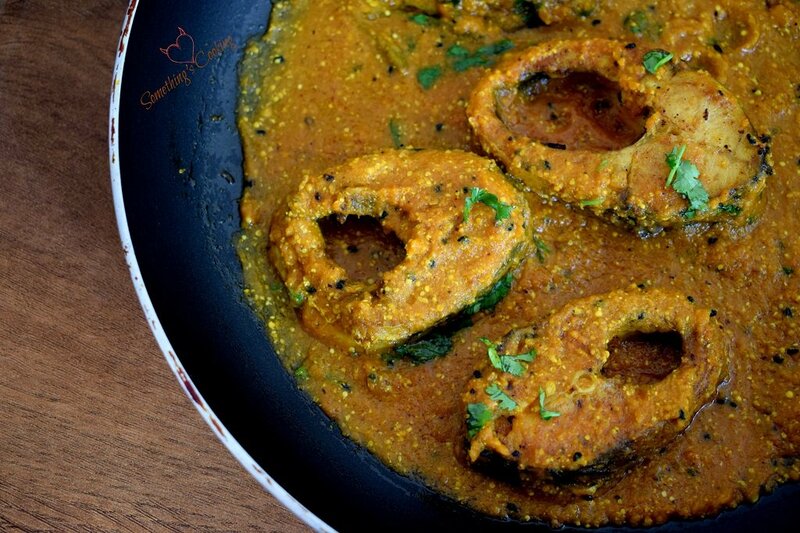 The Bengali Mustard Fish calls for frying the fish steaks in mustard oil before adding to the curry. You can pan fry like I did or deep fry. There are many different ways to making this dish. I had tried a few before which in the end turned out to be a catastrophe. Yeah, I have one of those days as well. 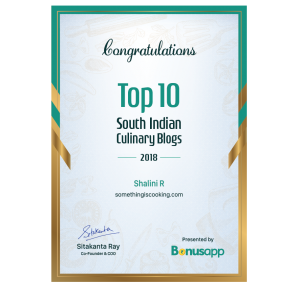 That’s when I saw an Insta post on Mustard fish by one of my favorite bloggers, Nabanita who blogs at Nom Nom with Naba and Random Thoughts – Naba. She had generously given me her mother’s special recipe and man, it was good. Marinate the fish pieces in turmeric and salt. 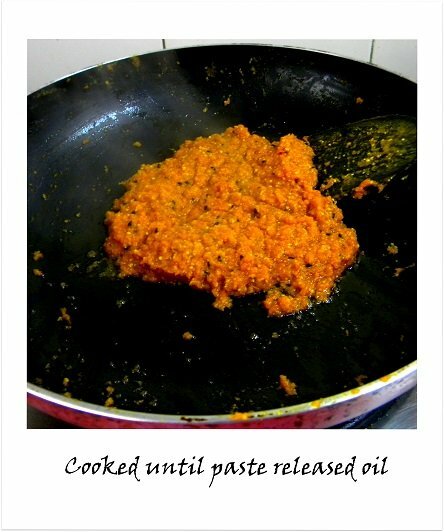 Blend tomatoes, garlic, green chillies and powdered mustard seeds and add to the pan with mustard oil. Cook till excess water is evaporated and oil is released. Add water and simmer. Pan fry the marinated fish pieces. Fry on both sides and add to mustard gravy. 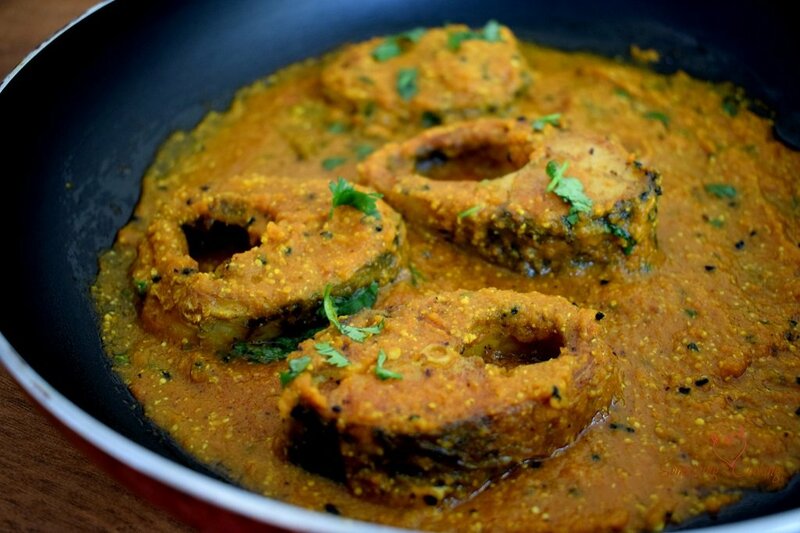 Pan fried fish steaks simmered in a tomato-based curry scented with mustard oil. Marinate the fish steaks with little turmeric powder and salt. Keep aside. Powder yellow mustard seeds to yield the required amount for curry as per recipe. 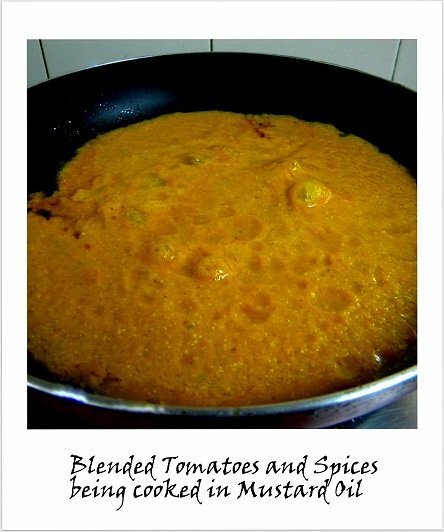 Blend tomatoes, garlic, 3 green chilies, powdered mustard, salt and half cup of water to a smooth paste. Keep aside. Heat mustard oil in a pan until smoking hot. Remove from fire for 30sec and then keep back. Add nigella seeds and let it sizzle for about 10 sec. Add the tomato-mustard-chilli paste. Cook until the excess water is evaporated and oil is released. This would take about 10 mins. Reduce heat and cook for anouther couple of minutes until it darkens a little. Add one and half cups of water, mix well and bring to a boil. Simmer for about ten minutes. 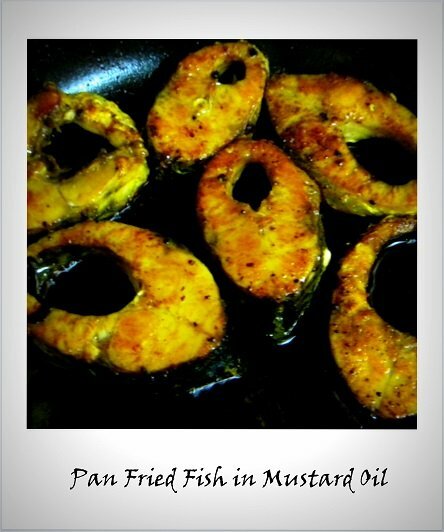 Pan fry the marinated fish steaks in mustard oil until golden brown. Add the fish to the mustard sauce and cook for a couple of minutes more. Garnish with coriander leaves and serve hot with steamed rice. The fish looks super yum. I love fish and I am sharing this recipe with KG to cook it for us this weekend. Thanks Shalini and Nabanita for this recipe. I know! I was thinking just that. How come you don’t like fish much! And oh yeah, will definitely prepare in case we meet 🙂 Come over! Kill me now! I cannot believe that I’ll never be able to make this thanks to being married to a vegetarian. But I’ll take this recipe with me to my mom’s place and try it there fir sure. The pictures looks so damn yummy! P.S: Good job on the step to step pictures. It makes it easier to understand. Please try to do this for all of your recipes from now on. Oh, that’s sad. And I understand. But please do try when you can. And thank you so much. I am trying to improve the photographs. 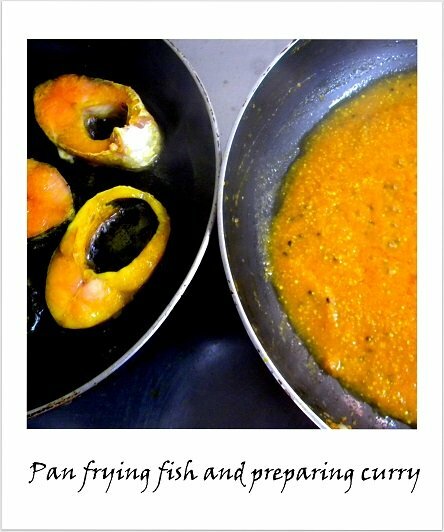 I love fish and I love curry so this is a great recipe for me. It looks delicious. This is so yummy. I feel like eating the pictures. 🙂 I also love the mustard curry. Recently perfected the recipe after a few tries. Like you mentioned, it takes a little getting used to for non-Bengalis. This makes me yearn fish once again… 🙂 Love the recipe.. i had tasted a similar dish once and had loved it.. Okay, all Greek to me, poor vegetarian that I am! Cheers all the same! This seems yummy. Don’t know how my tummy will react to mustard oil though 🙂 Will try. You make me miss home… I haven’t had this in years… Gosh how much I miss the taste. 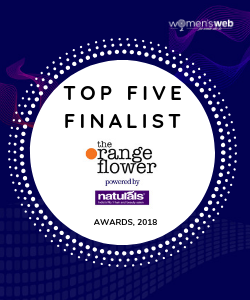 I need to google what nigella seeds are though. This sounds so delicious, Shalini. I love dishes like this but would be scared to try it myself. We have friends from Bangladesh who invite us over to their place for Bengali food and it’s so delicious. They told us about how Tilapia is a popular fish there. I have tried it a few times. I’m not that great a cook and tend to do very simple recipes as I’m not that adventurous. When we go for lunch with our friends, it’s such a big treat.